Former San Francisco 49ers QB , Alex Smith, is getting settled into Kansas City quite nicely as the Chief’s starting QB for this 2013 season. According to his teammates and coaches, Smith is “super intelligent”, and has displayed a very high “football IQ”. I’m sure this definitely helps rebuild and boost his confidence, as due to his concussion last season he was replaced by Colin Kaepernick. Then after being medically cleared to play, Harbaugh chose not to rush Smith back in and started Kaepernick for the following game and remainder of the season. Since Smith isn’t spending as much time in CA anymore, there doesn’t seem to be much need to keep his big 5,600 sq-ft home. Which is why he recently listed it on the market for $3.250M. 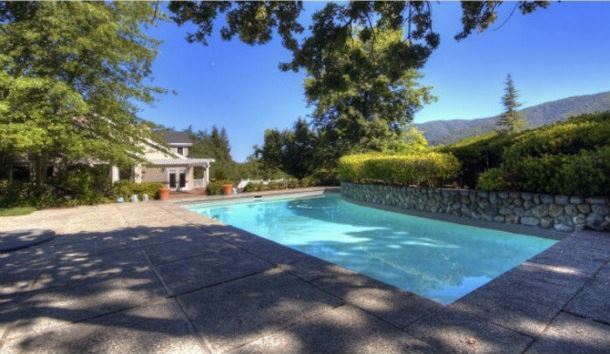 Smith’s 4 bedroom, 3.5 bathroom home is 5,644 sq-ft and located in the well to do suburbs of Los Gatos. The home features an open floor plan with vaulted wood beamed ceilings, a huge floor to ceiling stone fireplace, custom built-ins, a massive entertainment size kitchen, a 1200 sq-ft Master Suite, a home theater, wet bar, and an extensive rear deck that overlooks the custom in-ground pool and spa with rock features, and the gorgeous and uninterrupted Bay Area Views. If you’re a home buyer looking in Los Gatos, call for more details. Photos and content courtesy of Trulia.com. Listed by Cherish Atkinson Zubillaga of Sereno Properties.